Double Nomination for inTAXicating in 2014: Canadian Weblog Awards. I understand that inTAXicating has been nominated twice in the 2014 Canadian Weblog Awards in the Business and Career category and for the Lifetime achievement award which means the blog has been around since 2009. What I like about the Canadian Weblog Awards is that they are a juried competition (I was a juror 2-years ago) because they celebrate quality over popularity. It’s not traffic numbers that matter, but also great writing and great design. The awards really do show off the best and brightest bloggers in Canada and it’s amazing how big these awards get year after year. I feel like the award should be called the Schmutzie in honour of the creator and operator of these awards (and a pretty awesome blogger), Elan Morgan aka Schmutzie. Best of luck to all nominees! Author Warren OrlansPosted on November 12, 2014 November 17, 2014 Categories taxationTags Accounting, Awards, best business blog, blog, blogging, Canada, Canadian, Canadian Weblog Awards, intaxicating, lifetime achievement, nominee, recognition, Schmutzie1 Comment on Double Nomination for inTAXicating in 2014: Canadian Weblog Awards. Deductions, Deductions, Where Fore Art Thou Deductions? For those of you who prefer to wait until the last-minute to do your taxes – remember the deadline is May 5th, 2014 this year only – you might be just now looking for items to deduct in order to reduce an amount owing, or just because you have to get that information and now you are wondering if they are deductible. Or, maybe your tax return has been completed for you and now you are holding the draft of that return and before you sign it – which tells the CRA that you agree with the information in it, so you cannot say I didn’t know what was being filed! – and you want to make sure your accountant / tax preparer did their job and notified you of all the eligible deductions you are entitled to, then this post will be quite useful to you! The big question: What you can deduct? When preparing your tax return there are many deductions and tax credits you may be eligible to claim in order to reduce the amount of tax you must pay, if they apply to you. Any eligible deductions are reported on lines 205 to 485 of your personal tax return. More specifically, deductions from income and tax credits are reported on lines 205 to 485 and these lines are deducted from line 150 to give you your net income amount (line 236). Here is a line index from the Canada Revenue Agency website listing the deduction and for more information you will need to follow the link and read the details. Lines 244 – 260 are deducted from line 236 to give you your taxable income amount (line 260). Lines 300 – 378 are non-refundable tax credits and reduce your federal tax. However, if the total of these credits is more than your federal tax, you will not get a refund for the difference. Remember to claim the corresponding provincial or territorial non-refundable tax credits to which you are entitled on your provincial or territorial Form 428. Lines 405 – 485 are your federal and provincial or territorial taxes payable, your federal and provincial or territorial tax credits and your refund or balance owing amounts. The federal and provincial or territorial tax credits reduce your tax payable. If the total of these credits is more than your total tax, you could get a refund for the difference. Claim all available provincial or territorial tax credits on your provincial or territorial form which may be applicable to you. Complete the provincial or territorial tax and credit forms for the province or territory where you resided on December 31, 2013. Author Warren OrlansPosted on April 25, 2014 April 25, 2014 Categories Canada Revenue Agency, TaxationTags 2013, Accounting, Canada, claim, CRA, deductions, expert, filing, help, intaxicating, link, prepare, Revenue Canada, tax, where3 Comments on Deductions, Deductions, Where Fore Art Thou Deductions? After spending close to 11-years working in the Canada Revenue Agency (CRA), I have a very good idea what gets people into tax trouble. Okay, I know exactly what gets people into tax trouble, and while it’s nearly impossible to list them all, I can tell you that there are ways to get out of tax trouble which many have never considered. I also know that getting a refund back from the CRA isn’t always a good idea. More on that later. I can honestly say, without any prejudice that the main problem has to do with firms advertising at tax time about getting the most money in the fastest way possible. These ads are aimed at people who equate getting their money back fast through the quick, cheap filing of tax returns. “Get the Largest Tax Refund Possible”. Just hearing those advertising slogans scare me, and it should scare you too. Getting money back from the government at tax time, does not mean what you might think it does. You are not getting money from the government because you fell into a threshold, but what you are doing is getting your money back from the government. Your money that you overpaid (or were over-deducted at source) which the government kept during the year – held interest-free in fact – which you are asking for back. It’s akin to lending someone money for a year – they use it, or invest it and make money off of it – and then a year later you ask for it back and you get it, while they made money off of it. So how does this tied into tax debt? History has shown me that people do not wake up in the morning and decide that they want to start carrying a balance owing to the Canada Revenue Agency. Nobody wants to worry when they go to use their debit card that there might not be funds there as a result of a CRA bank garnishment, or when they go to sell their home find out that there is a lien on it. Tax problem occur over time and as the time passes and interest accumulates, people find their ability to deal with it declines and before you know it, the amount owing is massive and the CRA is breathing down your neck. So imagine if after rushing to have your tax return completed – so you can get back a couple of hundred dollars – you find out that you owed money instead. Now you have a tax problem. A tax problem that you have not budgeted for. Now in collections, you have time find a way to pay off this amount owing, and fast, before the CRA takes legal actions. You can ask friends and family for money, or consider a second job to pay that off. It can be done, it can take time, or it can snowball and you become a chronic tax debtor in the eyes of the CRA. Now the fun starts. Visits to your house, your employer and notices to your bank or clients all run the risk of causing you long-term embarrassment. If only there was a solution available to help out the repayment. This scenario could be completely different if you have taken the time to speak with an accountant, or a reputable tax firm and knew in advance that you might owe and together you had the opportunity to determine the best way to handle this impeding debt by placing money into your RRSP, or applying for, and claiming deductions to reduce your amount of taxes owing at year-end. With a good accountant, your tax planning is not just for the current year, but also for future years. One of the first questions I ask a prospective client, or anyone who comes to me for tax advice, is who completed your tax return and what are their credentials. It’s important because I have taken tax returns which owed the CRA $3000, $4000 or $5000 each year and turned them in to $4000 and $5000 credit returns just by claiming deductions and tax credits available to those taxpayers which their tax preparation service either didn’t know about or didn’t care about. You only get so much service for $50. There is nothing illegal in doing that, and provided that there is legitimate supporting documentation, the CRA wouldn’t reject the claim. So instead of rushing to have your return completed for $40 or $50, think about spending the extra money this year and take advantage of an accounting firm which will sit with you, determine how to minimize your tax expenditures for this year and for future years. Pay what you owe and not a cent more, and if you’re getting money back every year find out why. Learn which deductions you may be eligible for and start keeping your receipts. Take control of your year-end tax filing and stop sending the CRA penalty and interest revenue. If you already have a tax problem, you need to have tax experts review your prior year tax returns to look for missed deductions and credits. With a simple amending of the return, your balance could be reduced or wiped out completely. This really is the best way to start resolving your tax problem. It’s what I do. For you. If you are looking for an alternative, some assistance, or have tax questions, contact us at info@intaxicating.ca and let’s get the ball rolling. 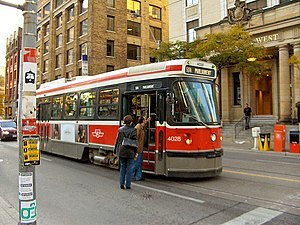 TTC fares to increase! Don’t forget the CRA’s Public Transit Deduction. Whether you like it or hate it, it is almost a certainty that TTC fares will be increasing in the City of Toronto at some point later this year or early in 2014. The City of Toronto requires additional funding in order to FINALLY start building subways in the city and the TTC needs extra funds to improve it’s crumbling infrastructure. Either way, if you are a user of public transit, you need to be aware that you may be eligible for the Canada Revenue Agency’s Public transit deduction. Who can claim these deductions? your or your spouse’s or common-law partner’s children who were under 19 years of age on December 31, 2012. But I do my own tax return. Where does this go? It goes on line 364 of Schedule 1, Federal Tax, enter your total public transit amount. Amount shown on a T4 slip – Enter the amount from box 84 on line 364 of Schedule 1. Note: If your employer paid your public transit pass, it is a taxable benefit included in your employment income. Reimbursement of an eligible expense – You can only claim the part of the amount for which you have not been or will not be reimbursed. However, you can claim the full amount if the reimbursement is included in your income, such as a benefit shown on a T4 slip, and you did not deduct the reimbursement anywhere else on your return. Always remember that if you are going to claim this amount you must keep your Supporting Documentation – receipts and transit passes – In case the CRA asks to see them at a later date. the identity of the rider, either by name or unique identifier. If the pass does not have all of this information, you will also need to keep receipts, cancelled cheques or credit card statements, along with your pass(es), to support your claim. The CRA will accept receipts (letters) generated by employers or Employer Pass Program Coordinators for employer transit pass programs. The receipt should note the purpose, exact amount received, date of payment, and name of the payee. Generally, the CRA will NOT consider a bank statement to substitute for a valid receipt, however, if your bank statement clearly indicates the purpose of the debit (for example, Employee FareCard), they will accept it as support for your claim. If your current accountant does not ask you whether you take public transit, then you need to think about what else they are ignoring, and what other deductions you may be missing. Passionate about Tax. Passionate about helping people. A link to the CRA website to verify this information is below. Author Warren OrlansPosted on October 28, 2013 October 28, 2013 Categories Canada Revenue Agency, TaxationTags Accounting, Canada, canada revenue agency, Common-law marriage, CRA, credit, Deduction, Experience, Expertise, intaxicating, Public transport, Tax Services, toronto, Toronto Transit Commission, TTC4 Comments on TTC fares to increase! Don’t forget the CRA’s Public Transit Deduction. I came across an interesting article on the H&R Block blog site regarding the Canada Revenue Agency (CRA) and their upcoming strategy regarding dormant GST accounts. The original article can be found right here. Having spent almost 11-years working for the CRA – almost 2 of those years dedicated to GST, I am very familiar with the problem the CRA faces by having many GST accounts open and unaccounted for. When the CRA is unsure as to whether the account is open, active and not filing, or open, inactive and never used can often be difficult to determine is the phone number and address on file at the time of registration are no longer applicable. As many of you are already aware, not filing GST returns is a criminal offence under the Excise Tax Act for which the CRA can, and will prosecute taxpayers. When the CRA moves to action on these accounts their intention is in their approach so if they suspect the file was opened in error, or can be sure it is not required then they will call, or have a field officer drop by the residence or business to ask about the account. If, however, they have reason to believe that the account is open and just not-filing, maybe as a result of a telephone conversation, then they approach this completely differently. In this case, the CRA will begin to collect information for their permanent diary and see how the story differs from the information provided by the taxpayer. Once they notice a difference, they move in with a Demand to File, which is an indication that they intend to prosecute. The CRA understand that taxpayers register GST accounts then move and fail to update their address with the CRA (HUGE mistake!) at which point the CRA needs to determine if the account is inactive or a non-filer. If this is you, or someone you know, it’s best to take care of this right now. A common example would be this; a taxpayer opened a business which operated as a sole proprietorship (SoleProp) for 18-months until it incorporated. The new corporation (NewCorp) registered a GST account and began to make its quarterly installments, while the SoleProp no longer had any income attached to it, but instead of closing it, the owner filed nil returns for the next 3-years. This is an example of an account the CRA would happily close over the phone because the trail is clear and both are current. Normally, you need to complete a RC145 Form (used to be a GST11)– Request to Close Business Number Program Accounts in order to close your GST account, however under this program, the CRA will close the account if you give them permission over the phone. Whether the account is closed or not, you still have to file all your outstanding GST/HST returns and pay any amounts owing up until the day your business ends because closing your account does not exempt you from paying any GST owed back to the CRA. In addition, if you have business assets and shut down the operation, the assets are deemed disposed of at Fair Market Value (FMV) on the day you stopped operating so you will need to calculate the GST on the value of your assets, too. You will also want to make sure that you capture any bad debts on that final GST return if you have not previously. If you sell to a purchaser who is a GST registrant and who continues to operate the business, you can jointly file a Form GST44, Election Concerning the Acquisition of a Business or Part of a Business, so the purchaser does not have to collect and you do not have to pay GST. The important thing to remember about the GST is that once you open an account it remains open until you take action to close it. If you have a dormant GST account and the CRA is calling you, it will save you time to answer the phone and provide permission to close it. If you fail to close it and the CRA is unable to get in touch with you, they can enforce collection actions against you and raise director’s liability to hold you personally liable to corporate debts, as well as the previously mentioned criminal prosecution. Stopping this kind of action can be difficult once the CRA has determined that you are hiding something from them. Do not wait for the CRA to come collecting their returns or their GST, but if you are already embroiled into a battle with the CRA over notional assessments or GST amounts owing, or worse if you have received a Demand to File notice from the CRA that they are intending to assess you as a director of the corporation and are seeking a due diligence defence, you need professional help right away. Just visit http://www.intaxicating.ca and see how Intaxicating Tax Services can assist you in all your CRA matters. Passionate about Tax. Passionate about helping people. A couple items are coming down the pipeline at the CRA – so say my sources in Headquarters in Ottawa. Since They are a couple years off at best, here are the main 2 which will have a significant impact on the general public, especially in industries where there is a lot of filing of slips and returns to be done. These items were announced in the 2009 budget on January 27, 2009. 1) Mandatory Electronic Filing for Information Returns – The CRA is tired of getting paper, loads and loads of paper which they then haev to key into their systems which is why they began converting systems about 10 years ago, so they could accomodate the vast amounts of informatin tehy expect to be receiving electronically. Yes, a lot can be filed with the CRA electronically, on CD rom, or directly through the website, but going forward the CRA will charge a penalty to those filing in any way other than electronically through their website or via XML filing. A smart move! 2) The CRA is in the process of developing a Canadian equivalent to the US W8 / W9 forms which require residents and non-residets of the US o complete valid forms and submit them to transfer agents in order to qualify for a reduced amount of tax withholding, if applicable. From what I’m told these forms will go hand in hand with the NR4 form and will be a Canadian version, so light on the requirements for now, but used by the CRA going forward. Actually, my sources tell me that these forms will only need to be completed by people whose actual residential address is unknown since the CRA uses that address (domicile) for determining the treaty rate. Sounds like good times are coming… Tell you friends.